Right now, all we can do is pause, hope, and for those who pray – to pray. Canon Andrew White, one of Tanenbaum’s Peacemakers in Action, was interviewed from Baghdad where he continues to tend to the dwindling Christian community and their neighbors. He remains in Iraq, even though he tells us that ISIS is descending on Baghdad. Word is that they are about 5 miles out. Andrew is supposed to have some protection from Iraqi soldiers assigned to defend him. But his soldier told him that, if ISIS comes, he will take off his uniform and run! Andrew believes that ISIS must be defeated by ground troops – but there are none. And meanwhile, the roads out of Baghdad are blocked. And so I ask you to join us today – to pause and remember Andrew and all the Iraqi people. We are deeply saddened to report that a 5 year old Christian boy, named Andrew after our Peacemaker Rev. Canon Andrew White, was murdered and cut in half by Islamic State terrorists (ISIS) during an invasion of Qaraqosh, a small Christian town in Iraq. Known as the Vicar of Baghdad, Canon Andrew White has declared to news sources that he refuses to leave Baghdad. VICE News filmed a short documentary series about Andrew and his work which can be found in our blog post here. Under the cover of nightfall, ISIS terrorized the small town of Sinjar located in the mountainous region of northern Iraq. By the following day, thousands of atrocities had been committed and documented on social media – children beheaded, crucifixions in the park and deplorable acts of violence that haunt the soul. A Friend Flees the Horror of ISIS is the story of Karim as published by The New Yorker. Karim is a Kurdish member of the Yazidis, a religious minority group in Iraq that has been vehemently targeted by ISIS because of their religious beliefs along with Christians and other minority groups. 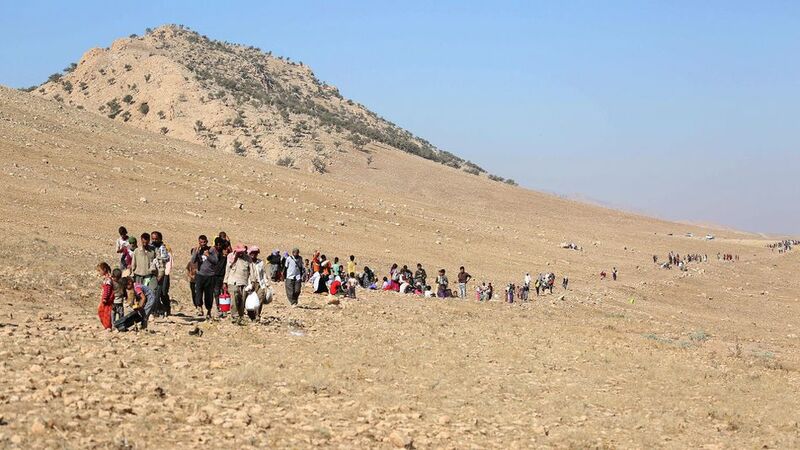 IRAQ: Be Aware, Stay Committed: A statement by Joyce Dubensky, CEO, on the atrocities committed by ISIS against the Yazidi people. Also in Iraq, Tanenbaum Peacemaker, Canon Andrew White, the ‘Vicar of Baghdad’, declared to the Huffington Post that he refuses to leave Iraq, despite Christian Persecution by ISIS. Peacemaker, Canon Andrew White is Chaplain at Baghdad’s St George’s Anglican Church. In a CNN video, he estimated that St. George had approximately 6,000 members – and in the last ten years, more than 1,200 have been killed. That is a death toll of 20% – or in other words, 1 in every 5 church members is now deceased. On a more uplifting note, “The Religious Market Theory of Peace“ is a new report that outlines seven reasons why religious freedom promotes economic growth. Research was conducted by Brian Grim, President of the Religious Freedom & Business Foundation, and Roger Finke, a Penn State Professor. They concluded from data analysis that religious freedom reduces corruption and fosters peace by decreasing violence related to religion – thus contributing to economic growth and stability. That is how Rev. Canon Andrew White lives his life: beyond comfort zones and within the lawless and chaotic Red Zone in Central Baghdad, Iraq. Lovingly dubbed the “Vicar of Baghdad,” Andrew is a steadfast leader in Baghdad not only for his church, Saint George’s Episcopal Anglican Church, but also as head of the Foundation for Relief and Reconciliation in the Middle East, a relief and reconciliation program that supports the masses (Christians and Muslims alike) and coordinates reconciliatory efforts between Sunni and Shia leaders. Andrew’s daily efforts, logistical challenges and reality are documented in “The Vicar of Baghdad”, a new three-part Vice Media special. Vice Media, known for being outspoken and bold in their news coverage, intimately portrays Andrew’s work on the ground. The candid look into Andrew’s daily life begins in a car; the camera shakes while lights flash red down a dimly lit street. From the passenger seat, Andrew narrates the situation, “It’s dangerous just sitting here.” These words color his actions, whether he is aware of it or not. He persists with his mission, guided by his peacebuilding practice and faith. Despite multiple kidnappings and death threats he does not sit still. Andrew is constantly on the move, visiting his parishioners and standing in solidarity with those in Iraq. In recent days, the militant group the Islamic State, or IS, formerly called ISIS (Islamic State of Iraq and the Levant), continues to encroach upon Baghdad. According to Andrew, the country’s infrastructure is failing and people are dying daily. Iraq’s problems deepen with their presence and ongoing sectarian violence. Currently, Andrew and his people are surrounded by constant gunfights and dwindling outside communication. Unwavering, he continues to fight for peace and solidarity in Iraq.